In the context of the Church of Christ of the 60s, 70s, and 80s, though, that slogan was an apt one. Most of Harding’s constituencies, I’m convinced, would have latched onto the idea of “educating for eternity” fairly easily. The slogan wouldn’t have drawn many outsiders, but it wasn’t supposed to. Subsequently, though, Harding “progressed” and began to revision itself, for better or worse, as the “Harvard of the South.” The constituencies were broader and more numerous; the context for the slogan therefore changed, and eventually, so did the slogan. 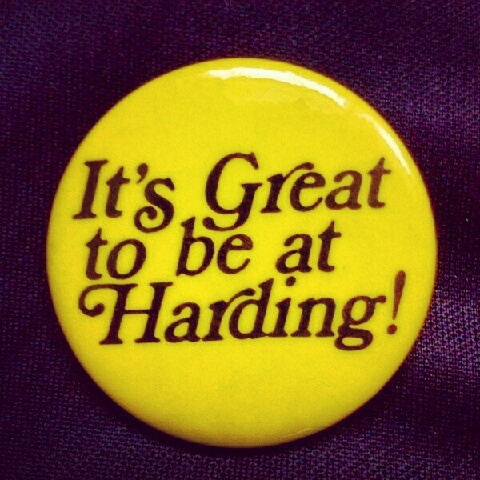 Here’s another Harding slogan. I’m pretty sure this one had its origin in the servant heart of one very likeable, charismatic (in the non-miraculous sense), little, white-haired, charming man. It’s so simple that it’s almost timeless, context-less. But the logo aspect appears passe, doesn’t it? The institution at which I now teach, Houghton College, had this slogan emblazoned on its fleet vehicles and letterhead when I arrived five years ago. I kind of liked that one. But when it went the way of the mammoth and mastodon, I realized that it, too, was a slogan that had outlived its contemporary context. Actually, it was probably ill-advised at the outset, not unlike “Educating for Eternity.” Yes, I get “higher purpose,” and the inclusion of the mind is clever for a higher-ed institution, and especially one that has way-above-average aggregate SAT scores. But … imagine the constituent of another “Christian institution”¹ as the Houghton van passes by. “Hmm. We are trying to be Christian, too. Do they think they’re better than we are?” Or, worse, imagine the basic, secular person who might have heard of Houghton but who knows nothing about it. The phrasing “Higher Purpose” might have sounded differently cocky and/or out of touch. Postcript These educational institutions’ slogans bring to mind that education occurs regardless of marketing. Personally, I’m learning some tough lessons recently, and I’m not learning them very easily or willingly. I’m also learning biblical Greek in a much more intentional way than ever before. What are you learning these days? ¹ Strong, well-founded feelings of lots of Christian college teachers and administrators to the contrary, I’ve been unconvinced for more than 20 years that the “Christian institution” notion is one grounded in reality. The people are generally much more than nominally Christian: most at Harding and Houghton, for instance, are more serious than the average bear about their Christianity. It’s that the organizational workings of an institution are so often at odds with the needs of individual Christian disciples, and a world apart from the priorities of the Kingdom of God. The British Monty Python comedy troupe once mocked the “chartered accountancy” profession, which I took as roughly comparable to the in-house-slash-CPA accountant line of work in the U.S. It’s not that I want to mock the chaplaincy profession, exactly. I just want to question it. Hospitals have chaplains. Prisons have chaplains. And the military has chaplains. I suppose it stands to reason that the student government and each academic class on a Christian college campus would have a chaplain. A student from 3-4 few years ago comes to mind — she had been elected, as she was fond of saying, to serve simultaneously as “chaplain of everything” (three different, somewhat overlapping music student organizations). In my limited experience, chaplains have been decent, basically good men & women. My parents have a good friend who served for more than 30 years as an Air Force chaplain. He’s a good guy. I knew a guy who was involved in a church plant at the same time that he was a hospital chaplain in a sizable city. He was a good guy, too. Especially in the case of students, I assume that those elected have exhibited some spiritually minded trait that at least marginally impressed a marginal number of peers. Or, peradventure, there were simply more posters and fliers with that person’s name. (Catch the drift of my faith in the election process?) I’m not sure what the chaplain of the sophomore class really does, but presumably that person at least gets asked to lead a couple of public prayers every year, and maybe s/he organizes dorm devotionals like a military company’s calisthenics. Once someone is a officially a chaplain, officialness may take over. Gone are the days of spontaneous insight and Christian living and more or less apt devotings–replaced by the need to organize and serve in official capacities. Now, it’s office and liturgy over meaning and content. That happens to a lot of us. Once we get ensconced and entrenched, we lose something of the substance. I worry about this regularly in my work–periphery can so easily eclipse central tenets and essence. But the more official, public, and visible the person, the worse this syndrome. Worse, though, than creeping supercession of clergy function over authentic, meaningful Christian influence and leadership is the watering down and amalgamation of everything that goes under the name of religion into the chaplain’s office. At some point, soon after being nominated or elected to the chaplaincy, one is forced to pluralize, accepting and supporting everything from Wicca to Mormonism, including those who think it’s cool to be newly Muslim, hippy-California-Buddhists, and an odd Zoroastrian adherent or three. In the case of a Christian college chaplain, the spectrum will of course be more narrow, but it still may span Seventh-Day Adventism, Calvinism, Romanism, televangelism, Lutheranism, Pentecostalism, anabaptism, Methodism, and community churches. Whatever. No matter the mainstreamness or out-in-left-field-ness, it is necessary for a chaplain to be inclusive. This is his job. Soon, the chartered chaplain either passes out from exhaustion or retreats into officialdom, having lost his reason for being (elected or hired). There once was a Chaplain named Jones. Wasn’t Jewish or Hindu or Muslimmy. Then temper the Jewish rummy. Now Jones has retreated to talk on the phones. Forgive me. That wasn’t exactly standard limerick form, I know, but it was fun nonetheless. I would like to state clearly and preemptively that this post will be about an abiblical doctrine. That doctrine is that of the “Christian Sabbath.” In order to wax pugilistic with this all-too-common teaching that dances glibly around the ring, I will list some facts without much explanatory comment. Consider each one a jab, or a hook–or a roundhouse knockout punch. “Sabbath” is by definition Saturday, the Seventh Day. Neither Father nor Son is ever documented as having rested on Sunday. Neither Father nor Son is ever documented as having blessed Sunday. The New Testament nowhere forbids work to be done on Sunday; no penalty is provided for Sunday’s “violation”; no blessing is promised for Sunday’s observance; and no regulation is given as to how Sunday ought to be observed. Neither God, Jesus the Messiah, nor inspired men ever said one word in favor of Sunday as a sanctified or holy day. No sacred title is applied to it. The Roman Catholic institution transferred the thinking from Saturday to Sunday. According to a catechism document, this occurred because Christ rose from the dead on a Sunday, and the Holy Spirit descended upon the apostles on a Sunday. These provide a reasonable basis for moving away from Saturday observance, to be sure, but why did the Catholic Church feel it could or should make this new law that Sunday is now the Sabbath? Because of the “plenitude of that divine power which Jesus Christ bestowed upon her,” it is said. I would like personally to support the notion that Sunday is indeed a special day in the Christian church. I do believe Sunday should be special. I am no Seventh-Day Adventist or any other kind of Seventh-Day advocate. I believe in Paul’s message to the Galatians, certain messages of Hebrews, etc. : the New Covenant has rendered the Old obsolete and of no current effect. I believe there should be Christian gatherings on Sunday, and on every Sunday except one or two in my entire life, when I wasn’t sick, I have been part of one or two such gatherings. I believe we should remember the Lord Christ’s rising, and I believe that that occurred on Sunday (even though the scriptures aren’t explicit about the exact time). I also believe that the removal of worship gatherings from Saturday to Sunday is entirely appropriate, but this supposition comes more from informed conjecture than from scriptural fiat. We need rest. I need rest. (I worked 70+ hours last week, and it’ll be 60+ this week, when all is said and done.) God wanted the Jews to have a regular rest day. It’s probably a good idea for me to set aside some time these days, too. That is my prerogative, as I believe it’s a good idea during a particular week/day, and Sabbath is not — repeat not — a law God has continued under the New Covenant. Invite me to consider more, or even more regular, rest if you sense that I need it. But do not tell me that Sunday is the Sabbath. Do not tell me I can’t stack wood or unload the dishwasher or mop the floor or lift my horse out of a ditch or change my oil in the afternoon or (gasp) catch up on a couple hours of work, in order to make my Monday feel a little less crazed. And do not tell me I can’t offer something meaningful to our Christian community on a Sunday afternoon because it violates some ethereal, legacy-notion of Sabbath — when I was all the while trying to support that very ideal with some good, thoughtful, recreative music and memorial content. And do not get all sanctimonious, decreeing that we must have our “Sabbath” (meaning Sunday) while you’re loading more work on me, figuring glibly that there’s some human way to accomplish it in five six long days of work, and while you’re not compensating me according to contract, promising to take some of the current compensation away soon, and taking away more of related funding that would make my work life more manageable. Across-the-board social injustice seems more important to address than bogus, legalistic, anachronistic concepts of Sabbath, doesn’t it?